This is a traditional Bengali dish . 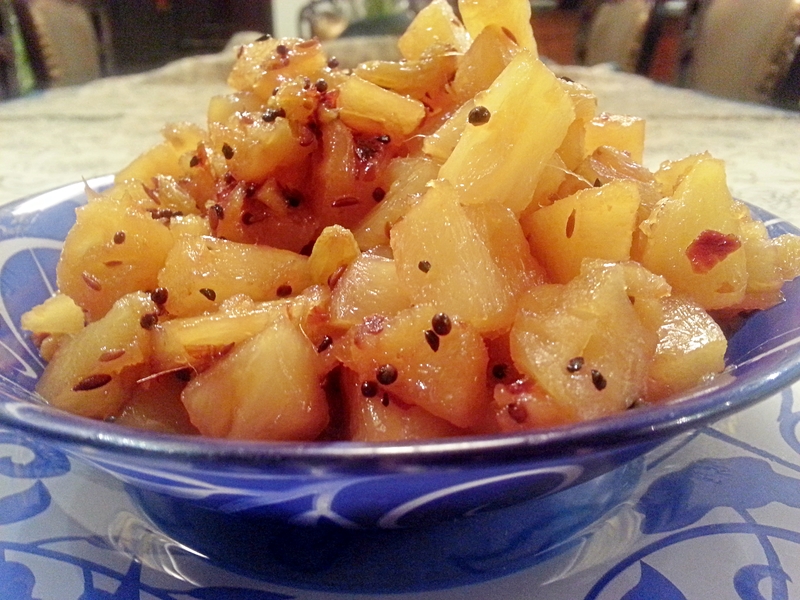 This dish is so refreshing and tasty, golden pieces of pineapple dotted with plump juicy raisins ( yumm..) I could just eat the whole thing alone. It has plenty of visual appeal with a taste to match . The ginger adds a lot flavour and depth to the dish . People usually eat this with yellow dhal and plain boiled rice but i love to eat it with cheese , it just tastes divine . This is a beautiful condiment to eat with roast ham, hot or cold.You can serve it as a side dish for any vegetarian or non-vegetarian meal. It is equally delicious if made with mangoes , my mother-in-law used to love the mango version and would get this made every day in summers when mangoes are in plenty .You can keep it in the fridge and just have it chilled it is just perfect in every possible way . Drain your pineapple in a sieve and reserve the juice.Chop the pineapple rings into small chunks and keep aside. 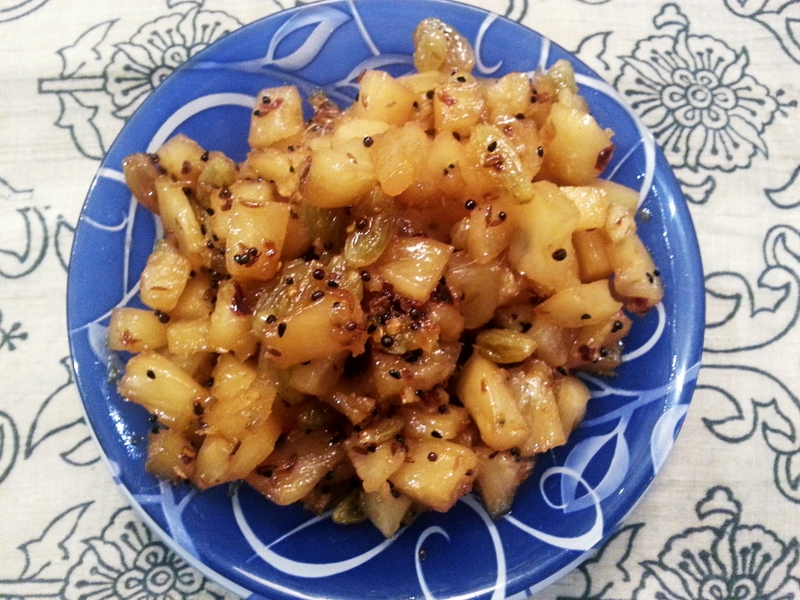 Heat the oil in a non-stick pan over medium heat and add the cumin seeds as soon as they pop add the black mustard seeds and the onion seeds as soon as they crackle add your grated ginger and chilli flakes, stir for a few seconds .Now add your chopped pineapple , raisins ,sugar and salt and stir. Add 1 cup of the pineapple juice that you had kept reserved to the pan and bring the mixture to a boil , reduce the heat and cook your pineapple uncovered for 20-25 minutes . Let all the juice dry up it will be a bit caramelised a bit sticky .Take the pan of heat and eat with joy in your heart.